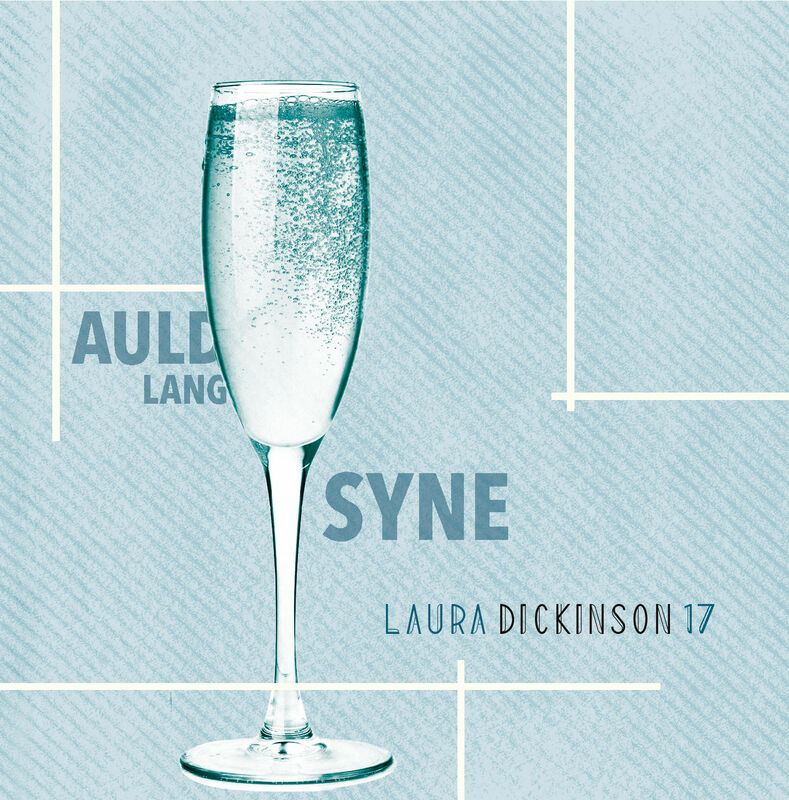 Just in time for the holidays comes an album from Grammy-winning music producer, vocal contractor and studio singer Laura Dickinson. Her album “Auld Lang Syne” was released November 20, 2018 and is a program of songs centered around the Christmas holiday season. This album is thought as a loving tribute to a time of year when people sincerely open their hearts to family and friends, and count their blessings while reflecting on the year gone by. The record features excellent big band arrangements by top names like Johnny Mandel, Brent Fischer or James A. McMillen and brilliant vocal arrangements by Laura herself. The album begins with the big band at full speed with “Happy Holiday / The Holiday Season”. Fantastic swinging by band and Laura Dickinson make sure that nobody starts to fall asleep during the holiday season. One blues chorus of solo go to trumpet, alto sax and guitar and then the horns get their chance to show off. A really great arrangement played and sung perfectly. “Christmas is Starting Now” continues in full-speed-Christmas-spirit with another cool big band arrangement where all sections can show their skills. Trombones, saxes and trumpets and especially the drums have all highlights in the 2:46 minutes of this song. If you plan to have a dance party at Christmas, then this is the right song for it. “Peace And Joy” is the next tune on the album and we hear Laura Dickinson together with a 24-voice choir including some of her vocal contractor colleagues. This tune is (again) perfectly arranged and sung and brings us back to the traditional more contemplative Christmas mood. “The Man with the Bag” features Steve Trapani on bass-trombone, which other instrument would represent Santa better? Very entertaining, dynamically arranged and played. “Love, You Didn’t Do Right By Me” from the movie “White Christmas” features Kye Palmer on trumpet. He switches to “How Deep is the Ocean” in his solo. Laura gets her chance as well here with an impressive finale of the song. “A Marshmallow World” is the next song and returns with it’s sweet and happy sound to the classic picture we have of American Christmas. “Miss You Most At Christmas” is a cover version of the Mariah Carey hit, but Laura’s version has much more power and emotions than the original. The incredible string arrangement creates a very natural sound and makes this song to my favorite on the album. “Let It Snow!” surprises with an extraordinary and extravaganza arrangement in New Orleans style by James A. McMillen. Here is one of those versions where I am really surprised about the ideas and creativity of well-established arrangers. “Have Yourself a Merry Little Christmas” features Laura and pianist Alan Steinberger. Another ideal opportunity for Laura to show her mastery, her vocal range and her perfect intonation. 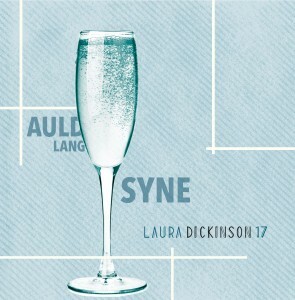 The final song on the album is the title song “Auld Lang Syne” (Old Long Since) which is the traditional tune sung in the English-speaking world at midnight on New Year’s Eve to bid farewell to the old year. The tune is based on an old Scots folk melody and the arrangement of guitarist Andrew Synowiec revives that spirit. Guitars and Laura’s for several voices singing dominate this tune. To summarize it, the album is an impressive collection of outstanding arrangements presented in a impeccable manner by a great big band and an incredibly versatile Laura Dickinson. The album covers different nuances of the Christmas spirit from sticky sweet to melancholic back to a big party and ends with the right song for New Year’s Eve, so it is the perfect companion for the whole holiday season. Almost exactly a year ago I presented the Gary Williams album “At The Movies”. In the meantime I saw Gary last October in London at Ronnie Scott’s Jazz Club and met him afterwards. He came with an excellent band and I had an unforgettable Sunday lunch in this club. 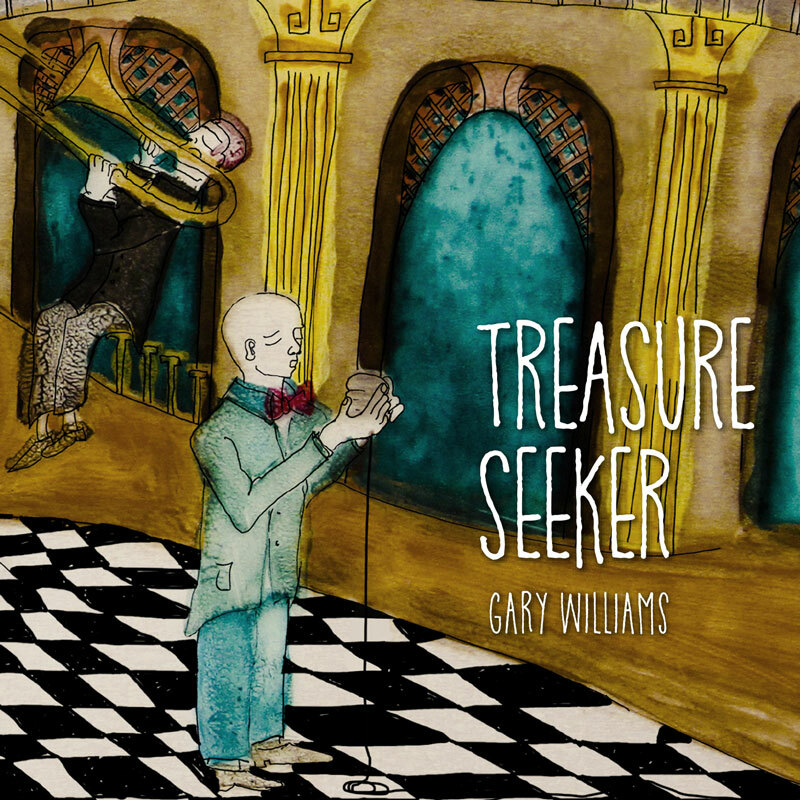 Gary has just released (officially yesterday on September 19) a new album called “Treasure Seeker”. 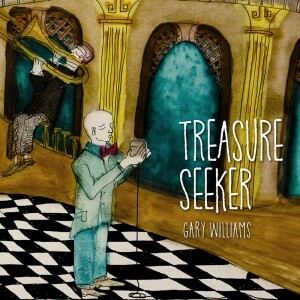 What makes this album quite remarkable is the fact that it has only originals on it, so this is the debut album of the singer-songwriter Gary Williams. 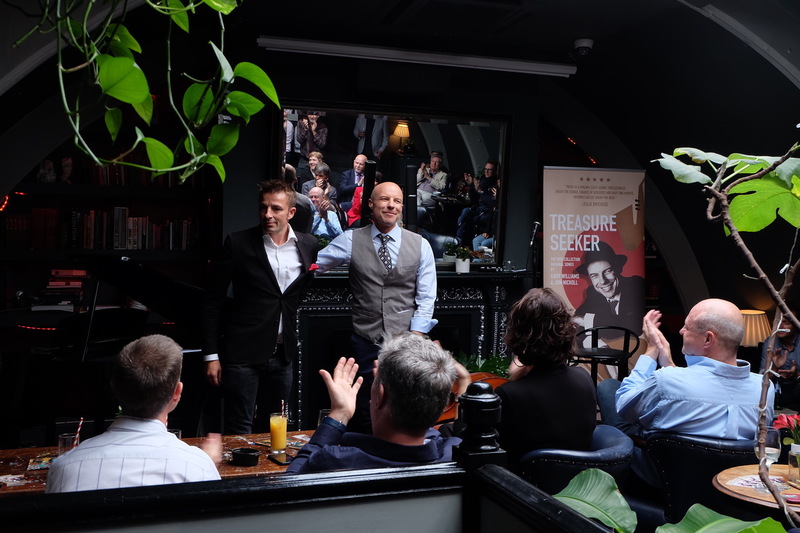 Together with pianist Jon Nickoll (who is the resident pianist at the Savoy Hotel’s American Bar) twelve songs have been written, arranged and recorded for this album (the song “When Sunday Comes” is found twice in different arrangements, so the album has a total of 13 songs and a playtime of 44 minutes). Gary presented some of the songs yesterday in London and I had the chance to attend this event. The picture shows Gary Williams and Jon Nickoll after performing together. There is some constancy and some evolution from the last album, the constant part is the band, the arranger Phil Steel and the Kenilworth studios, where the album was recorded. The evolutionary part is the songs, music that we have never heard before, songs where Gary put his feelings and his experience of life into words. The album starts with the song “The Next Big Thing”, with the horn section at full tilt and a nice twist between the title of the song and the lyrics , because Gary sings “I don’t need to be the next big thing”. A short and crisp song to launch this album. “Never Say I Love You” has been pre-released as a single on Spotify and is a beautiful soft song, not too slow, not too fast, with an excellent piano solo and again this extra wink between the title and the lyrics: “You can never say I love you too much”. The album continues with “Kiss Me On A Rainy Day”, a slow love song with a superb big band arrangement played with great dynamics. This is just one of those tunes where Gary shows his coolness, regardless what the band does, he stays soft and relaxed. “When Sunday Comes” starts with a nice acoustic guitar intro and we hear another soft and easy song, this time in Latin style, with the clear advice to “turn off the phones till Monday”. One of my favorites on the album, the steady groove comes from the acoustic guitar with some percussion. The Fender Rhodes sound is anyway something I just can’t get enough of. “Don’t Trust A Wink” shows the hard swinging Gary Williams. Accompanied by an outstanding big band, this tune is another highlight of the album. The praise goes to Phil Steel, the band and especially Graeme Blevins on saxophone. The album continues with “Growing Pains”, a ballad with just Matt Regan on piano and Gary Williams on vocals in a very intimate setup. “I Blame The Moon” sounds like a traditional folk song (or like a song from the soundtrack to “Lord of the Rings”), with the flute playing the intro and interlude and the acoustic guitar picking arpeggios, a very soft and romantic song, supported by strings and a harp. “Don’t Talk About Time” is next, a nice pop-song, again featuring Graeme Blevins on saxophone. 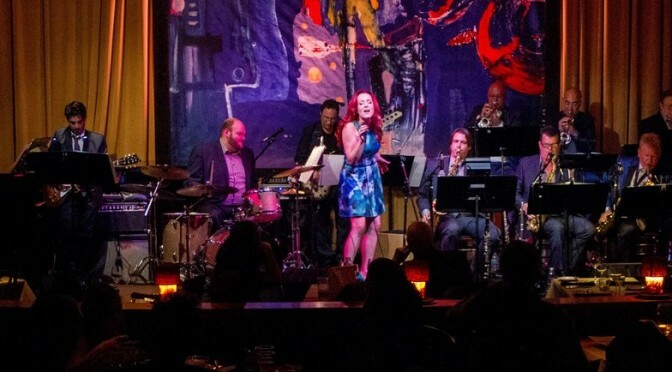 “The Dreamer” brings back the big band sound, this time with a jazz blues. It reminds me of songs like “Route 66″. We hear solos by Graeme Blevins on saxophone, Clive Dunstall on piano and Tommy Emmerton on guitar and again the incredible brass section that consists only of Malcolm Melling on trumpet and Chris Traves on trombone (who is also the studio engineer). The album continues with “Our Love Grows Stronger”, a soft love song arranged in an easy Latin-style with an acoustic rhythm guitar, Fender Rhodes and saxophone, pleasantly laid-back and relaxed, this is the kind of song that you typically associate with Gary Williams. The encore is a Boogaloo version of “When Sunday Comes”, this version has teeth compared to the Latin groove before. The band shows again how precise and accurate it can play and Graeme Blevins on saxophone is one more time the soloist. Unfortunately, that’s it. But the good things is that you can hear Gary live in London. The show on September 30 at Ronnie Scott’s is sold out, but tickets for his Christmas shows are already on sale. Alternatively, just book Gary for your next birthday party, you won’t regret it.